972-937-8433 Proudly serving Waxahachie, Ellis County and the DFW metroplex. How Do You Diagnose TMJ/TMD? During your visit, Ellis County Family Dentistry will take a detailed dental and medical history. Be sure to tell us about any symptoms or injuries to the jaw and notify us of any chronic illnesses or medications you are taking. 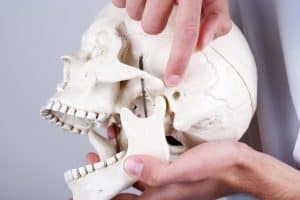 We will perform a comprehensive exam of your head and neck and pay particular attention to the jaw muscles and joints. We may recommend a screening X-ray to rule out other issues. At this point, we can recommend an initial treatment plan in most cases. How Do You Treat TMJ/TMD? Our team will recommend a treatment plan based on your individual needs. We can help relieve TMJ/TMD pain, reduce stiffness, and increase function in one of the most important joints in your body. Contact Ellis County Family Dentistry today at 972-937-8433. Please click here to download the new patient form and fill out the patient history and medical history forms prior to your visit. Ellis County Family Dentistry offers services in preventative, sedation, cosmetic and general dentistry along with treatments for TMJ/TMD, emergency care and dental implants. We gladly accept new patients and we look forward to bringing you into our dental family. I was always skeptical about dentist, however when I first walked in the office I felt a warm family feeling. Once I got back the whole staff was warm friendly and very professional. The seats were so comfortable and it massage your back when getting treatment. I absolutely love the whole office. Make this dentist your dentist. The entire experience was great. The front desk, the assistants and Dr. Atkins are a excellent. Never been a big fan of Visiting the Dentist office, but they make me feel comfortable and well taken care of. I very highly recommend. Nothing but 5 stars for Dr. Atkins and his team. They are SO professionally and do an amazing job. I’ve been to other chain types of dentists (monarch dental etc) before and felt like they could care less about their jobs and they were just in it to collect their check and move on to the next one. Dr. Atkins and his team go above and beyond in providing you with the best care and making sure you are comfortable. Wouldn’t go anywhere else. Highly recommend! Great experience! Love the hygienists! Very caring and gentle!!! Dr. Atkins is great! He has your care as his first priority. Best of all, he is not retiring anytime soon!!!! This was by far the best dental visit I have had with any dentist. I have found my new dental home. Went back to get my permanent crown and still have found my new dental family! Dr. Atkins and the team are more then amazing! I really enjoyed my visit and felt like I was being treated respectfully and correctly! I am looking forward to my next visit to begin the proper procedure to get my mouth where it needs to be! Hands down the best dental staff in Ellis county. Every member goes out of their way to make each visit as pleasant as possible. I know it sounds crazy, but I actually look forward to my dental appointments.